Well its getting to that time of year with the darker nights and the weather turning colder, so its all about casseroles and one pot foods for me. We had been shopping at the weekend and managed to pickup the biggest cabbage we have seen. It turns out it is 5kg of white cabbage, so I wanted to make sure I had some really tasty meals to use this fantastic vegetable. 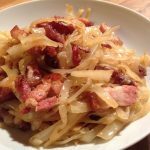 Growing up we would have ham ribs and cabbage for Sunday dinner, so bacon is a great paring for cabbage. I decided it could be turned up a bit and the next time I made this, I added a spoonful of whole grain mustard and 2 tbsp of creme fraiche, both are delicious versions, just see which you prefer. Delicious bacon bits and cooking the cabbage in the bacon fat and butter, fantastic flavours all around. Cut the Bacon slices into strips (lardons). Heat a large saucepan (with a lid) and add the bacon pieces to the pan, and cook until the fat comes out and the bacon is getting crispy around the edges. Remove the bacon from the saucepan and leave to the side. Add the cabbage to the saucepan with the bacon fat, stir around to cover the cabbage in the bacon fat. Cover the saucepan and cook for 5 minutes, allowing the cabbage to steam and fry. Remove the cover and stir the cabbage again, continue cooking until softened, then add the bacon pieces back into the saucepan and mix together. Add the butter to the sauce pan, place the lid back on and cook for another 2-3 minutes. 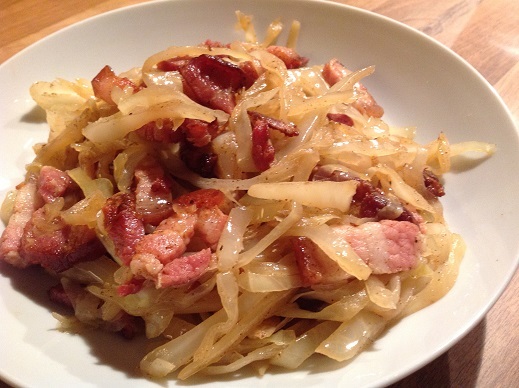 Place the Bacon and Cabbage into warmed bowls and enjoy.